BAT HOUSE CEDAR SMALL 18" X 7" X 6"
SMALL CEDAR BAT HOUSE: Our Small Bat Houses are made of cedar. The smallest one is a good starter house. It stands 18" tall, 7 1/4" wide and 6" deep. It will hold 5 to 10 bats comfortably. Seen here in the picture, this design is a very basic house which has been used for a long time. It has two chambers with grooves. These grooves provide notches which enable the bats to hang securely. 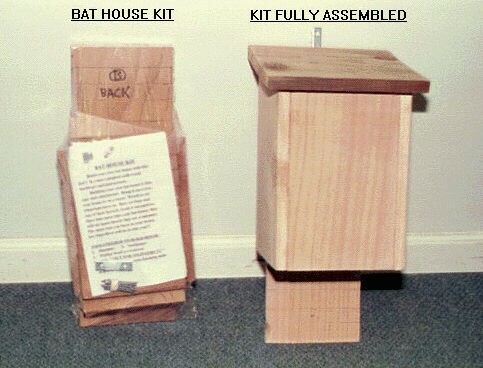 This small house is also available in a kit shown here on the right which needs to be assembled, once assembled it looks like the one shown on the right side. 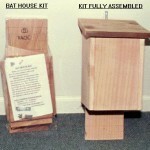 We sell this house all ready assembled (shown on the right) however the kit provides a fun project for children yet it is big enough for any serious bat enthusiast.The kit comes with hardware, wood, hanger, and directions for assembly. The wood is rough so it will need to be sanded. Our fully assembled house comes ready to hang. Comments on BAT HOUSE CEDAR SMALL 18" X 7" X 6"
Very nice! Great kit as advertised. Looks great.